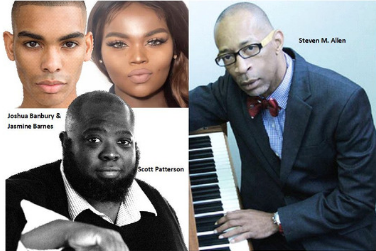 The Coalition for African Americans in the Performing Arts (CAAPA), in partnership with the Prince George’s Arts and Humanities Council (PGAHC), presents the Opera Composer’s Showcase featuring excerpts by composers Scott Patterson, Steven M. Allen, and duo Jasmine Barnes and librettist Joshua Banbury. Three / 20-minute segments of original operas are presented then followed by an on-stage interview by arts journalist Patrick D. McCoy, with composers sharing a brief overview and synopsis of their opera, description of characters, plot, and theme, as well as their inspiration. Upon completion of the vignettes and interviews, three professional classical musicians (composer, conductor, and vocalist) adjudicate to determine which composer will present their fully staged opera during CAAPA’s 2019-2020 season with funding, in the amount of $20,000.00, from program partners PGAHC.